Buyers from London and the South-East have been tiptoeing back to the West Country this year-and why wouldn’t they, when the sale of a three-bedroom flat in Hampstead or Pimlico will buy a substantial Georgian country house with land and stabling in a lovely part of Devon, Somerset or Cornwall? But these buyers remain extremely cautious and, for most, the 7% Stamp Duty payable on properties priced at more than £2 million, is a tax too far, says Martin Lamb, regional director of Savills. He cites The Old Vicarage at Dunsford, on the edge of the Dartmoor National Park, seven miles from Exeter, as an example of the kind of Devon property that is selling well, and quickly, in the current market. Built in about 1830, and refurbished by the vendors when they moved there in 1962, the five-bedroom, Georgian former vicarage, set in eight-and-a-half acres of gardens and paddock, was launched on the market at a sensible guide price of £1.1 million and sold for that figure within a matter of weeks. You get a lot for a million in Devon these days. His firm recently sold the classically proportioned, six-bedroom, Georgian Furlong House, near Chagford, in the Dartmoor National Park, to a buyer from the South-East: it came onto the market in May, and sold in July for £1.575m. Strutt & Parker (01392 215631) have been understandably conservative in pitching the launch price of the unspoilt, late-Georgian Egland House, near Honiton, east Devon, at a tempting £1.7m-well below the ‘killer’ £2m threshold. 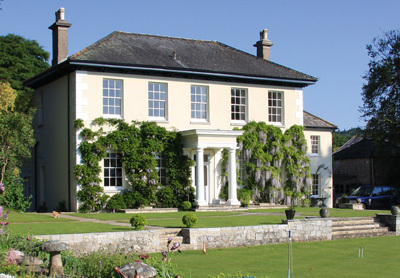 Arguably the most exciting newcomer to hit the Devon market this autumn, Egland House, listed Grade II, was built as ‘a gentleman’s villa’ in 1804 by John and William Lee of Honiton for Thomasine Anne Elliott. The house was remodelled for her descendants in 1931, in the Roman Doric style, by architect Walter Sarel-a regular collaborator of Gertrude Jekyll’s-and builders Dart and Francis of Crediton, who, between them, created the Edwardian Coombe Trenchard House with its famous Arts-and-Crafts gardens at Lewtrenchard, near Lydford, in 1906. Previously part of a large estate that was scaled down in the 1970s, Egland House is being sold, subject to probate, by the family of its late owner, who lived there for 35 years or more. The handsome main house is structurally sound and in good repair, having had its entire roof repaired about five years ago, although it obviously needs modernizing and redecorating. Spared the benefits of a full-blown makeover in the 1980s or 1990s, it has retained the simple Georgian elegance of its impressive reception hall, four fine reception rooms and six bedrooms, each of which has en-suite facilities. The former servants’ quarters on the first floor have been converted to a two-bedroom flat and, to the rear of the house, the coach house, known as The Mews, has garaging for four cars and, above it, a flat that needs refurbishing. Adjoining the coach house is a stable block and, behind it, a linhay or open barn. Egland House stands in almost 15 acres of formal gardens, grounds and parkland overlooking open countryside towards the Otter Valley. Intriguingly, a statue in the walled garden bears the inscription ‘From the House of Commons 1933′. With its 10,500sq ft of living space and magnificent setting, Egland isn’t just a cracking family house, but is ideal for a variety of alternative uses, such as a boutique hotel or high-class B&B, says selling agent Oliver Custance Baker. But it’s not only London buyers who are heading west, says Brian Bishop of Jackson-Stops & Staff in Taunton, who recently sold houses in Somerset to British expatriates returning to the UK from Moscow, the Netherlands and Switzerland. 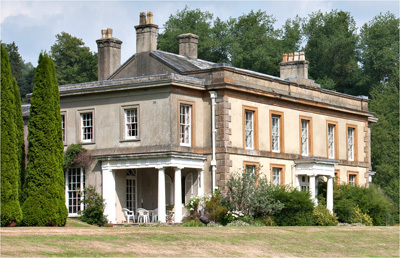 They were impressed by the ‘incredible value’ to be found in the western region, compared with London or the Home Counties, and were looking for proper family homes with the aim of getting their children into the Taunton schools, Mr Bishop adds Across the valley and over the hill from Egland House, handsome, Grade II-listed Ford House stands in a beautiful valley setting near the busy Somerset village of Wiveliscombe and is currently for sale through Jackson- Stops & Staff (01823 325144) at a guide price of £1.95m. Another important Georgian house in a splendid parkland setting, the impressively symmetrical Ford House was built in 1799 by Philip Hancock, a member of the Hancock brewing family of Wiveliscombe, with grounds laid out by Veitch of Exeter according to ‘the tastes of the day’. The house was remodelled by Mr Hancock in about 1840, since when it has remained virtually unaltered. With 7,371sq ft of living space, Ford House has plenty of rooms to spare, including a reception hall, four main reception rooms, a breakfast room, a gun room, four principal bedrooms, three bathrooms and five more bedrooms with two bathrooms on the second floor. But it is the 13 acres of grounds-all beautifully maintained by the present owners during their 10-year tenure-that make Ford House so special, with a carriage drive leading through large expanses of lawn shaded by magnificent trees, including beech, alder and a spectacular Acer palmatum, said to be one of the biggest in England. 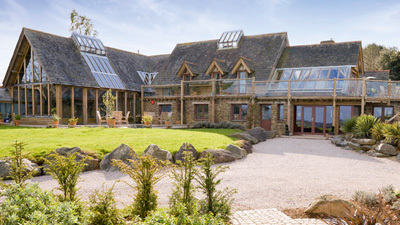 The South Hams area of south Devon has been one of the few parts of the county that has continued to attract buyers from the South-East during the recession, says Prunella Martin of Devon agents Marchand Petit: this year alone, more than one-third of their buyers came from London and the Home Counties. A notable exception to the £2m rule was the sale of Lamper Head, a striking contemporary clifftop house in the Dart Valley, designed and built in 1991 by Roderick James of the Carpenter Oak and Woodland Company of Grand Designs fame. Launched jointly with Savills in Country Life on January 23, at a guide price of £2.1m, it sold for about that figure in May/June. William Morrison of Knight Frank in Exeter (01392 423111) has also noted a distinct improvement in the number and quality of London buyers this year, most of whom have been cash purchasers. He fully expects the feelgood factor to spread across the Tamar, where the recently refurbished Trewin House, with 35 acres of land on the banks of the Lynher near Torpoint, a few miles from the Devon-Cornwall border, looks tailormade for a discerning London buyer at a guide price of £2.5m. 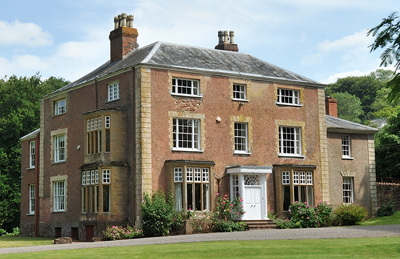 Research suggests that the Georgian core of Trewin House was built in 1750- 52 by the then owner, John Littleton, and later extended in the Victorian and Edwardian eras.